Flood plain management is a fundamental objective of Toronto and Region Conservation Authority (TRCA). This objective is achieved through policies that limit development within the flood plain. Knowing the extent of the flood plain is an important tool for land use planning and emergency management. This knowledge helps guide sensitive land use away from high-risk areas, and, for areas where historical development has already occurred, helps to identify ways to mitigate flood risk, all with the aim of better protecting people, property, and the resilience of our urban areas. In locations where the flood plain remains undeveloped, the risk to life and property is reduced. There are thousands of flood-vulnerable structures located in the flood plains within TRCA’s jurisdiction, either because they pre-date flood plain management planning policies and regulations, or because they were permitted under special policy and planning provisions. Watercourses and the associated regulated flood plain are one of the natural features and hazards that are components of TRCA’s regulation limit. You may still be in a regulated area, even if outside the flood plain. To learn more about the rules and regulations regarding development within TRCA’s regulation areas particularly within a flood regulated area, please see TRCA’s Planning & Permits section. To view TRCA’s Regulation Area Search Tool, please click here. As noted in the Disclaimer, the information on this website does not constitute a regulatory flood plain map as formally approved by a qualified Professional Engineer and TRCA. This viewer depicts a generalized representation of the regulatory flood plain and should not be relied upon for the precise limits of the regulatory flood plain. For confirmation of the precise flood plain limit and/or to obtain a copy of an up-to-date regulation flood plain map, please contact TRCA Planning and Development staff. The information on this website does not constitute a regulatory flood plain map as formally approved by a qualified Professional Engineer and TRCA. This viewer depicts a generalized representation of the regulatory flood plain and should not be relied upon for the precise limits of the regulatory flood plain. For confirmation of the precise flood plain limit and/or to obtain a copy of an up-to-date regulation flood plain map, please contact TRCA. The availability of the data from this flood plain viewer (“Data”) does not constitute a scientific publication, ownership or intellectual property rights. The TRCA and its suppliers and distributors do not guarantee the quality, accuracy or completeness of any Data provided to any user of the Data (the “Recipient”).Thus, to the extent permitted by law, TRCA excludes all warranties. The Data and its use is provided “As is” without warranty of any kind, including, without limitation, the warranties of merchantability, fitness for a particular purpose, identity or ownership of data or information, or that the use of such data or information will not infringe any patent, intellectual property, or proprietary rights of any party. Please note that the following frequently asked questions do not represent legal advice. For legal advice please contact a legal professional. In the event of riverine flooding, water levels rise resulting in the inundation of low lying areas adjoining a watercourse that are not ordinarily covered by water. Such areas are known as flood plains. High water levels are often the result of extreme watercourse flows, which are produced by extreme rainfall and snowmelt. Why is the flood plain important? Knowing which areas will be inundated by flood waters is an important tool for land use planning and emergency management. This knowledge helps guide sensitive land use away from high-risk areas, and for areas where historical development has already occurred, helps us identify ways to mitigate flood risk, all with the aim of better protecting people, property, and the resilience of our city for generations to come. What is the regulatory flood plain? The regulatory flood plain is the approved standard used in a particular watershed to define the limit of the flood plain for regulatory purposes. This standard is defined by the Ontario Ministry of Natural Resources and Forestry. Within TRCA’s jurisdiction, the regulatory flood plain is based on the more severe of the Regional Storm (Hurricane Hazel), or the 100 year storm; whichever is greater. For most of our jurisdiction, it is Hurricane Hazel. A hydrology model simulates the effect of this amount of rainfall as if it were over each watershed, taking into account the topography, soil type, land-use, and other characteristics to determine how much water would end up in our rivers and streams. A hydraulic model then looks at where this water would go, and what areas would be inundated. The inundated area for the regulatory storm is called the regulatory flood plain. How are the boundaries of the regulatory flood plain determined? Flood studies and flood plain mapping are prepared and approved for the Toronto and Region Conservation Authority (TRCA) by qualified Water Resource Engineers using standards and criteria established by the Ontario Ministry of Natural Resources and Forestry. Flood plains are determined based upon information gathered, analyzed and synthesized as part of a flood plain mapping update. Flood plain mapping studies are technical reports that use topographical information, surveys of infrastructure such as the size of bridges and culverts, land use information, weather data, stream flow data, and detailed hydraulic and hydrologic models of each watershed in order to determine the spatial extent of a flood plain. The flood plain boundaries are shown on detailed maps. Can the regulatory flood plain boundaries change? Yes. As each of the variables change (topography, infrastructure, land use, weather data, stream flows, and hydraulic and hydrological modelling techniques), so too will the resulting flood plain boundary. In order to ensure that flood plain boundaries are current and up to date, flood studies are commissioned every 10 to 15 years for each watershed within TRCA’s jurisdiction. When flood plain boundaries change some lands that were formerly within a flood plain could be removed and others added. Is it possible to be in a flood plain that hasn’t yet been mapped? Yes. Although the main branches of our rivers have flood plain mapping, which were created by qualified Professional Engineers and approved by TRCA, some headwater features and tributary areas may not have been studied yet or assessed to the standards and criteria set by the Ontario Ministry of Natural Resources and Forestry. 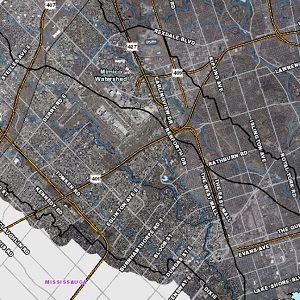 TRCA would assess these unmapped areas, which include the areas adjacent to a watercourse and determine the need for any required flood plain mapping if any change were proposed in the vicinity. Please note that TRCA’s Regulation limit applies to natural hazards including flood hazards, whether or not they have yet been mapped. What are the spill or undefined flood plain areas illustrated on the flood plain map viewer? A flood plain spill area exists where flood waters are not physically contained within the valley or stream corridor and exit into surrounding lands. As a consequence, the limit and depth of flooding are difficult to determine. Flood spill areas occur naturally or can occur as a result of downstream barriers to the passage of flood flows such as undersized bridges or culverts. Please refer to TRCA’s Living City Policies for further information on flood plain spills. Undefined flood plain areas are identified where the extent of the flood plain is beyond the boundary limits of the topographical map that was available at the time the flood plain map was created. Both spills and undefined flood plain areas are represented on the flood plain map viewer by a red line at the edge of the flood plain. Areas adjacent to spill and undefined flood plain locations may be within the flood plain, however, at the time the flood plain map was developed, there was insufficient information to accurately define the extent of the flood plain in these areas. For more information on the areas adjacent to the undefined flood plain or spill areas, please contact TRCA’s Planning and Development staff. Riverine flooding is what occurs when water levels of rivers, streams, and creeks rise and overflow their banks and spill onto adjacent areas. Conservation Authorities are responsible for determining the hazard from riverine flooding. Urban flooding such as street flooding, and basement flooding, occurs when there is more water than the local drainage system (sewers and streets) can handle, or when there is a lack of a major overland flow route from a low-lying area. Urban storm infrastructure is the responsibility of municipalities. The regulatory flood plain mapping shows riverine flooding only. Is flooding still possible outside the flood plain? Yes. The flood plain defines the flood hazard for planning purposes based on the standard set out by the Ontario Ministry of Natural Resources and Forestry. However unlikely, it is still possible to have a larger storm or a different combination of factors (for example, debris blockages) that result in an even bigger flood. Also, the flood plain is defined for riverine flooding only (see above). Urban flooding or basement flooding can occur anywhere when there is a lack of an overland flow route or the capacity of the existing drainage system is exceeded. What is the regional storm (Hurricane Hazel)? What is a 100 year storm? The term “100 year storm” is used in an attempt to simplify the definition of a rainfall event that statistically has a 1-percent chance of occurring in any given year, at any given place. A 100 year storm does not mean that it will only occur once every 100 years. Find out more here. Under what legal authority does TRCA map and manage the flood plain? Regulatory Role: The Conservation Authorities Act provides the legal basis for TRCA’s mandate to undertake watershed planning and management programs that prevent, eliminate, or reduce the risk to life and property from flood hazards and erosion hazards. TRCA undertakes flood plain mapping under the responsibility given to it under Section 28 of the Conservation Authorities Act and corresponding Regulation: Ontario Regulation 166/06, as amended (Toronto and Region Conservation Authority Regulation of Development, Interference with Wetlands and Alterations to Shorelines and Watercourses). Planning Role: As outlined in the Conservation Ontario/Ministry of Natural Resources and Forestry/Ministry of Municipal Affairs and Housing Memorandum of Understanding on CA Delegated Responsibilities, CAs have been delegated the responsibility of representing the provincial interest on natural hazards encompassed by Section 3.1 of the PPS 2014. This delegation requires CAs to review and provide comments on municipal policy documents and applications submitted pursuant to the Planning Act. For further details, see Section 3 of the Living City Policies. What does it mean if my property is within the regulatory flood plain? You and your property may be at risk of riverine flooding if your property is within the flood plain, although the degree of risk varies from site to site. Visit the Flood Risk Management page to find out more about how TRCA works to reduce the risk of flooding to people and property. There are also development and redevelopment implications if your property is within the regulatory flood plain. These are detailed in the Living City Policies, however, for site-specific information; we recommend that you contact TRCA’s Planning & Development staff. If you are purchasing a property and want confirmation of whether or not your property is regulated, please contact the TRCA Planning & Development staff. Is my property still regulated if it is outside the flood plain? Your property can still be within a TRCA regulated area even if you are not in the flood plain. TRCA’s Regulation applies to watercourses, valley and stream corridors, the Lake Ontario shoreline, wetlands and areas adjacent to wetlands where development could interfere with their hydrologic function. Please see the regulated area search tool here. Note – like the flood plain maps, updating of TRCA’s regulation mapping is ongoing. Please contact TRCA staff to clarify any discrepancies. What is a Flood Vulnerable Area (Cluster)? Currently defined as Flood Vulnerable Areas (FVAs) in TRCA’s Living City Policies, Flood Vulnerable Clusters (FVCs) are sub-areas within the Regulatory storm flood plain that contain multiple existing structures and/or roads for which a single, comprehensive flood remediation approach may be viable. These FVCs include Special Policy Areas (SPAs), as well as historical flood damage centres. For details about SPAs, please refer to TRCA’s Living City Policies. The FVCs within TRCA’s jurisdiction are illustrated on a map located in TRCA’s 2017 Flood Contingency Plan. Note that a FVC boundary is a general radius that includes a concentration of structures and roads within the floodplain. Thus, the FVCs conceptually illustrate these particular flood risk areas at a broader scale.